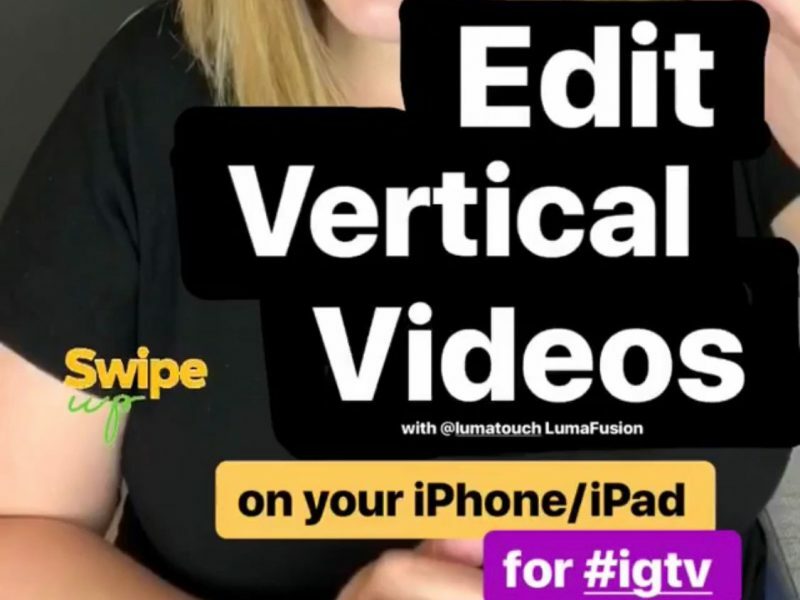 With the release of IGTV, I’ve been asked about how to edit vertical video for IGTV. Many Instagram-savvy folks are utilizing their iPhone for all-things-social these days, and when it comes to editing videos on an iPhone, it gets tricky. Luckily, there are some great video editing apps for iPhone, including LumaFusion. I created this LumaFusion tutorial for my own IGTV channel, so I hope you can put it to use as well. Click play on the video to get a feel for how to edit vertical video for IGTV on iPhone. I published a video on my IGTV channel on some of my thoughts on IGTV. I’m a YouTuber, right? 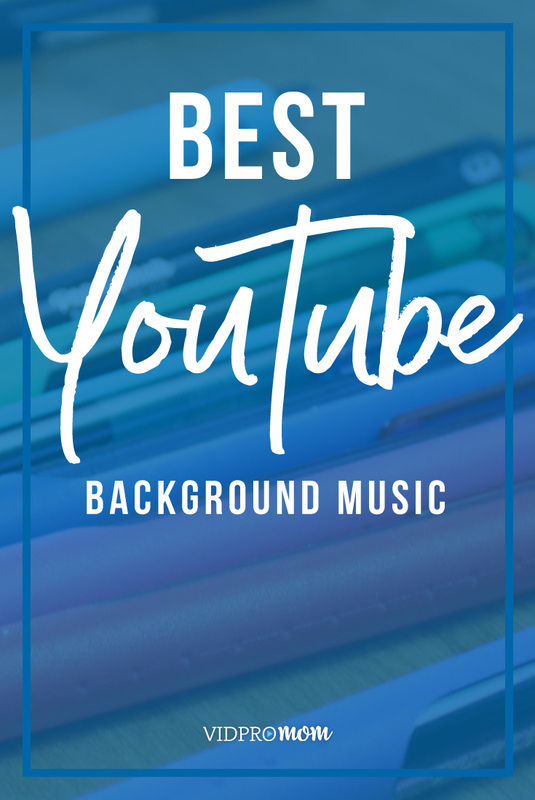 So, I have been hearing that IGTV is the YouTube killer, and I had some thoughts on that and people had some questions about how I recorded that video and how to edit vertical video for IGTV. Normally, I am adamantly against editing videos on iPhone or iPad because it’s so much faster for me to edit on my laptop with a huge monitor. But some people are more comfortable with editing on an iPhone or iPad, and further, for some folks, that’s all you have to edit videos on! For this tutorial, I am going to show you how to edit vertical video on your iPhone using a fantastic app called LumaFusion. It’s available for iPad as well, and I highly recommend it. So, I normally stay away from editing on my iPhone or my iPad, but since I recorded a vertical video on my iPhone, it only seemed right that I should edit the video on my iPhone too! One of the reasons I love LumaFusion is because it was easy to create a 9:16 ratio video. I have a bunch of video editing apps on my phone like iMovie, Adobe Clip, and Splice, but none of them seemed to have the IGTV size. I use Premiere Pro on my desktop, so I like to have fine tune precision control, which LumaFusion provides. I was actually shocked by the capabilities of this app on my iPhone! Below, you’ll find a quick 10 minute tutorial for how to edit vertical video that you shoot on your phone inside of LumaFusion, which I believe is only available for IOS devices. Recommendation: Use a stylus when editing video on your iPhone or iPad. It’s easier to make precise cuts and gestures with a stylus than it is with your finger. Okay, so I have LumaFusion here on my iPhone 10. I’m going to open it up. I already have my project going that I am editing for this video, but I want to show you how to start a new project. So, up on the very top, you’re going to have a little menu. You can hit that. You can see your past projects if you have any. On the bottom left hand side, you’re going to hit that plus button. You can name your project anything you want. Let me just say my project test. You want your frame rate to be 30 and you want your frame aspect … This is where you want to change this if you’re doing this for IGTV. You want it to be 9 to 16, right? So, 16 to 9 is that normal widescreen ratio that you would use for YouTube and if you were going to do a square video, it would be 1 to 1 ratio. We’re going to choose a 9 to 16 here. I’m going to hit this plus sign and we have a brand new project. So, over on the left side of your screen, the top left sort of corner, that’s sort of like a media bin. That’s where all your clips are on your phone. Let’s see, albums and all photos. That’s kind of where they all go. You can see I have my vertical videos here that I shot for my intro and outro of this video, right? So, on the right hand upper quadrant, this is your preview window. This is where you’re going to kind of see what you’re doing, see what you’re creating here, and then on the bottom half of your screen, this is your timeline and it doesn’t look much like a timeline now because there’s nothing on it, so first thing we want to do is add something to our timeline. So, I’m just going to use this clip here. I think this is my intro clip. Now, you can make some trims to this here if you wanted to, before you add it to your timeline, but I’m just going to keep the whole thing because I know there’s a whole bunch of different cuts and edits that I need to make to it, but you can preview it here. Just hit play, and then if you’re good with that, you know that’s the clip you want to use, you’re just going to hit that. There’s a little down arrow on the bottom left hand side of the preview area. You’re going to hit that and it’s going to go down to your timeline. Now, you have a blue indicator bar that stays vertical here in your timeline, and I’m just using my stylus or my finger to move back and forth along my timeline. You can see the wave forms. I’m going to go all the way back to the beginning. It’s going to take me just a second. Now, you can zoom in or out here, so I’m going to zoom out so you can kind of see what this whole clip looks like. It’s a five minute clip, so it’s going to take a little while for me to edit, but you can zoom in and out by pinching just like you would normally expect on a phone. You’re just using your finger, your stylus to move you clip and stuff back and forth. So, you can see where I’m just looking at my camera, messing with my hair, and then I start talking, right? You can see it in the preview window. You can see where my mouth opens, I start to talk, but you can also see it in the wave forms. So, right about here, I know that I want to cut out all that other stuff where I was messing with my hair, right? So, I’m just going to hit the scissor tool on the right hand side. It’s just like a little pair of scissors, and literally just cut that clip right there where that blue vertical time indicator bar is. So, now I can just select that first part of the clip here, this part here. That’s selected. It has that blue box around it. I’m just going to hit the trash can and it’s going to go away and now I have a new beginning of my clip. So, you’re basically going to go through your video here and just do the same thing, just watch your video play it back for yourself so when you get to a spot that you want to cut out or edit it, you just stop what you’re doing, use that scissor tool, and then either delete or you can also do … Let’s just say you didn’t necessarily want to cut anything out but you just needed to trim a little bit. You could take that very edge of your clip. What I’m doing is I’m dragging it to the right and it’s trimming, right? If you look at the wave forms, you can see it’s just trimming the end off. So, instead of just making cut, cut, cut, cut, you can trim it by just kind of sliding the beginning or the end of a clip to the left or right, just to get a little more decision. When you’re done, up on the very top right hand side, there’s the little share icon. It looks like an arrow pointing to the right. We’re going to hit that, and then you’re going to choose movie. It’s going to ask you where you want to save it to. I’m going to choose photos because that’s going to save to the photos, the regular photos app on my phone. It’s just going to save as a regular video and then I can just upload it to IGTV. So, I hope this little LumaFusion tutorial, beginner tutorial was helpful for you. If it was, would you do me a huge favor and share this with your audience? Just tag me in Insta stories or something and send people here, especially if you think it would be helpful for your audience. So, if you have people that are trying to figure out and navigate the landscape of IGTV not knowing how to edit their videos or shoot their videos, please share this with them. That would mean the world to me. Let me know in the comments if you have any additional questions or anything. Let me know if this was helpful. 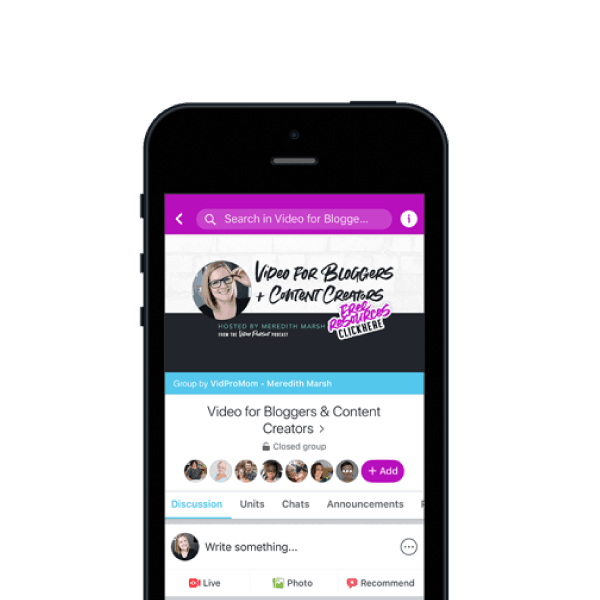 Let me know if you want to hear more about editing on a mobile device. The mission of VidProMom is really two things. 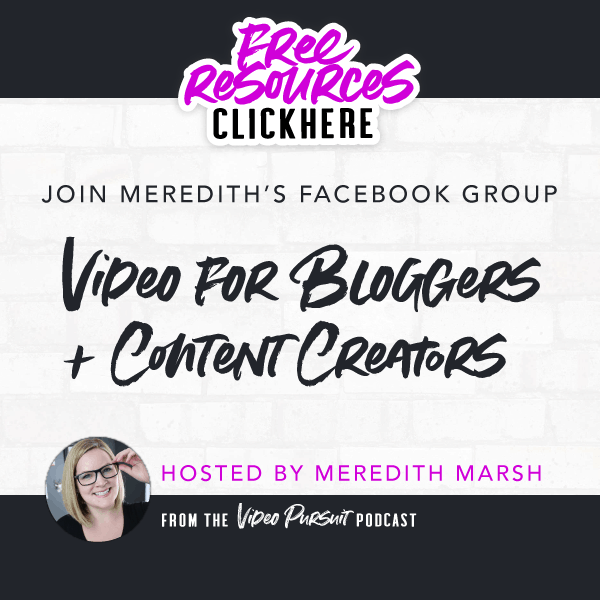 I want to help families create and capture relivable moments on video and I want to help fellow bloggers get serious about YouTube, and of course, IGTV if it’s going to stick around for a while, right?